In the autumn of 2008 Village Lights Bookstore was just beginning to take shape. 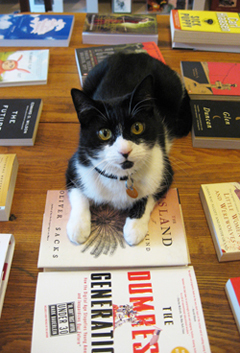 One day a young black and white cat sauntered through the open front door of the presumptive bookstore. Every bookstore requires a bookstore cat, does it not?? So the tuxedoed kitty immediately made himself at home, curling up for a nap on a bench by the window, as sawdust and the cacophony of construction whirled around him. An exceedingly easy-going, urbane, and cultured creature, this black and white feline fellow surely belonged to someone—that is what we suspected (and feared, since we were quickly becoming quite fond of him). The obligatory “Found Cat” posters were placed along Main Street, while we secretly prayed that no one would answer. A week later, with no responses, the posters were ripped down! Village Lights Bookstore now had its first resident feline—a tuxedoed Gentleman Cat named (what else) Oscar F. O. W. Wilde, Esquire, B. C. E. (Best Cat Ever).